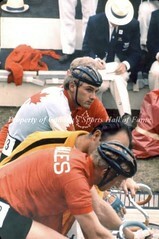 At the Edinborough Commonwealth Games in 1970, Jocelyn Lovell won gold, silver and bronze – Canada’s first cycling medals in 32 years. A sport was resurrected. Over his career, Lovell won more than 40 national titles. 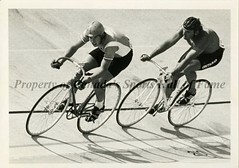 At the 1974 national championships he took five events ranging from the track sprint to the road race. At the 1978 Commonwealth Games, Lovell raced to three gold medals, all in record time. Later that year he took silver at the World Championships. Then, poised for Olympic glory, his dreamed dissolved as a result of the 1980 Moscow Olympics boycott. It was a difficult time, but nothing compared to what he faced in his recovery from an August 1983 accident that left him paralyzed. 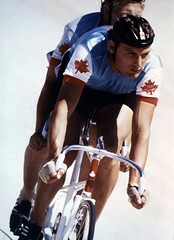 Colourful and controversial were the adjectives most often applied to Jocelyn Lovell as he dominated Canadian cycling during the 1970s. To those attributes, which were no less evident after his athletic career was tragically cut short, were added defiance and perseverance. Born in England, Lovell came to Canada when he was three years old. 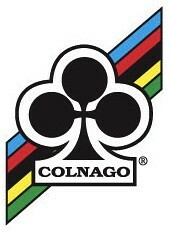 At age 15, as a junior, he won the first of what would be more than 35 national cycling championships. He made the 1968 Olympic team for Mexico City while still a teenager and finished a respectable seventh in the 1,000m time trial. But it was in 1970 that Lovell made his mark on the international stage. 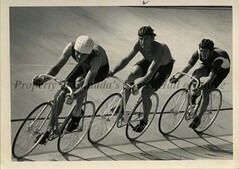 His victory in the 10-mile scratch race at the 1970 Commonwealth Games in Edinburgh made him the first Canadian in 32 years to win a cycling gold. He added silver and bronze medals at those Games. 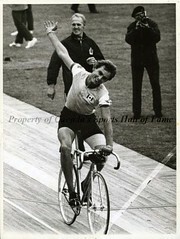 Lovell dominated the 1,000m time trial throughout the 1970s, winning gold at both the 1971 and 1975 Pan-American Games and in the process setting a record for the distance that would stand for 28 years. His more controversial side emerged in 1974—a year where he came within one event of winning every race at the Canadian championships—when what he called a “prank” resulted in his suspension from that year’s Commonwealth Games. 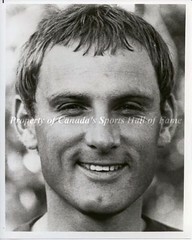 His successes, however, led to the 1975 Norton H. Crow award as Canada’s top male amateur athlete. Lovell competed at two more Olympic Games, though injuries prevented him from duplicating his Commonwealth and Pan-Am Games successes at Munich in 1972 and Montreal in 1976. Two years later, Lovell set out to achieve international success on home soil. At the 1978 Commonwealth Games in Edmonton he won three gold medals, all in Games-record times, becoming the first man to achieve such a feat. 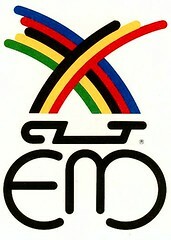 Later the same year he claimed a silver medal at the world championships in Munich. 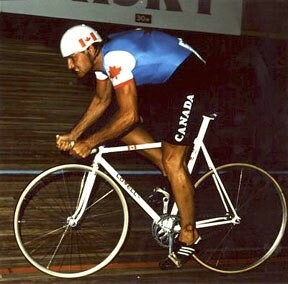 Lovell continued to compete as one of Canada’s top-ranked cyclists into the 1980s. 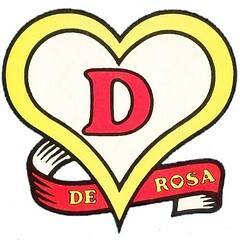 It was while training, on August 4, 1983, that his career came to a tragic end and his life took a dramatic turn. Run over by a dump truck and dragged 100 feet, Lovell’s spinal cord injuries left him a quadriplegic. Demonstrating the same fierce competitiveness and combativeness that characterized his cycling career, he has taken a leadership role advocating research into spinal cord injuries. This entry was posted in Riders and tagged Canadian Cycling, Jocelyn Lovell, Lovell, Team Canada. Bookmark the permalink. Thank you for bringing together this snippet of the life of a great athlete.